The versatile picture dictionary can be used in many ways to enrich vocabulary. Here is one way to use them for classifying and categorizing words. Be a spelling slueth! Find words within big words. Make new words from the letters of big words. These tasks are a blast! Only takes a little time, but involves a whole lot of learning! How do you introduce color recognition and color names? Do you focus the "basic 8"? Would you like your students (even the youngest)to expand their perception of color? These are fun and easy ideas you can share with the kids! If you're thinking about converting from desks to tables, here's a few ideas for you! That's Life! A Quote for You! Here's a nice little quote for the kids to ponder! 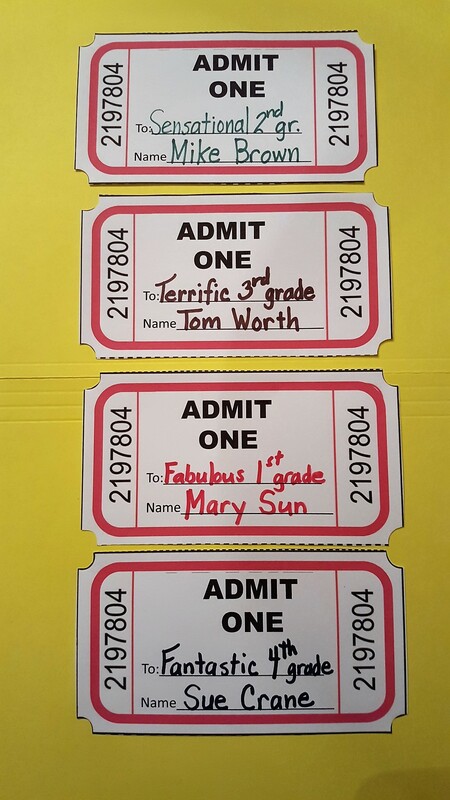 FREE Back to School Movie Ticket Name Tags. Don't forget the popcorn! Students introduce themselves to other classmates through a poem and puppets. Make apple puppets for beginning of the year apple poem.